Homemade Peppermint Patties! They’re the perfect treat to make for your sweetie for Valentine’s Day. The first time I tasted these, it was love at first bite. It was my company’s holiday pot luck luncheon last year, and my co-worker Charlie Huebsch brought in a batch of his wife Tisha’s homemade peppermint patties. I tasted one, stole a bunch more, and then begged for the recipe. Tisha, who loves to cook and bake for her two boys, Jackson and Thomas, had stumbled across this recipe on Pinterest looking for some new ideas for her school’s cookie exchange. She started adding a little more of this and a little more of that until she perfected the candy. 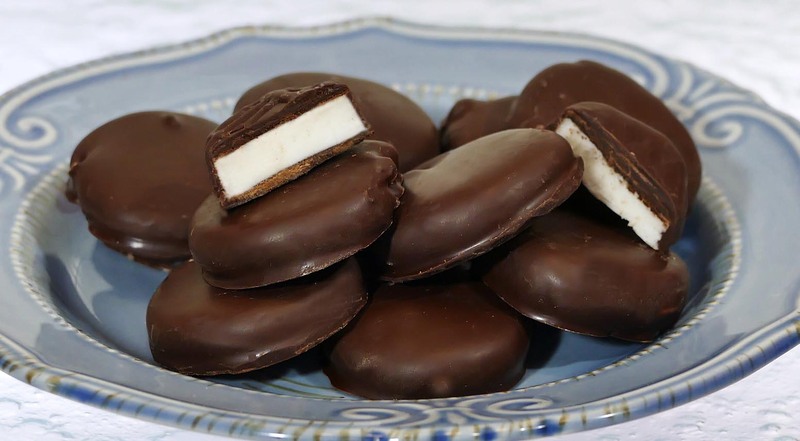 If you love store bought peppermint patties, you’re going to flip over the homemade version! I’ve renamed them Tisha’s Treasures, and the best part is, it only takes 5 simple ingredients to win someone’s heart! In a mixing bowl, combine the powdered sugar, butter, peppermint extract, and cream. On medium high, beat with a paddle attachment (mixture will be crumbly at first). Turn mixer on high and beat until it becomes creamy and smooth. Candy should be soft but not sticky. If too sticky, add more powdered sugar, a little at a time, until the consistency is that of PLAY-DOH. Roll out a long piece of plastic wrap. Scoop out mixture onto the wrap and form into a long thin roll, about 1 ½" in diameter (this will be the size of the inside of your peppermint patty). Roll it up tightly in the plastic wrap and twist or tie off the ends. (Jan's Note: I divided the mixture up into two logs and wrapped each in plastic wrap to keep one log chilled while working with the other. (Tip: To keep your candy round, cut a slit all the way down an old cardboard paper towel tube, and put the candy inside which will help keep the bottom from flattening as it sits in the refrigerator.)) Chill the candy until it is very firm, at least one hour. Prepare a sheet pan lined with parchment paper and place in refrigerator to chill. When candy has hardened, remove from plastic wrap and, using a sharp knife, slice off rounds about ¼" thick. Melt the dipping chocolate in the microwave in 30 second intervals, stirring to prevent overheating. Using a fork or dipping tool, dip a patty into the melted chocolate, coating completely. Let the excess coating drip back into the bowl. Set on chilled, parchment-lined baking sheet and repeat with the rest of the candy slices. Immediately refrigerate to harden. Store in airtight container in fridge or at room temperature.